We were more than a little excited to see the HARD Summer 2013 Lineup released yesterday, featuring some of the biggest names in EDM right now. The annual festival held in a beautiful Los Angeles Historic State Park plays like who’s who of the electronic scene. 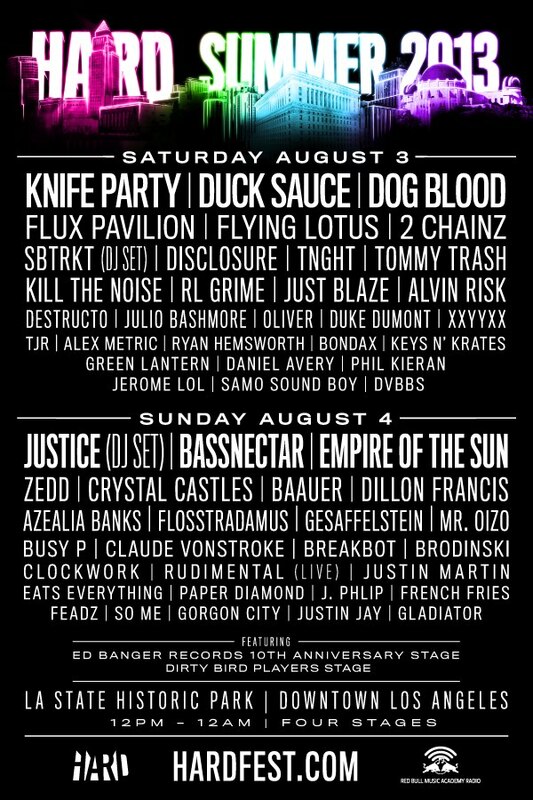 Of particular note is Dog Blood on the billing, a super duo composed of EDM juggernauts Skrillex and Boys Noize. While many casual fans will jump at the chance to see Skrillex at any billing, Dog Blood tones down on some of the qualities that make Sonny Moore so polarizing and wildly talented at the same time. The HARD Summer 2013 Lineup additionally features the Ed Bangar Records 10th Anniversary Stage, an area of the festival entirely dedicated to hosting many of the staple artists that helped develop the HARD scene in recent years. HARD typically features a universally themed stage — we’ll always have fond memories of James Murphy’s tenaciously funky 3 hour disco set. The marketing team certainly hit a home run with the trailer. While early bird tickets have completely sold out, general admission is still widely available to the general public. We have a sneaking suspicion this event will sell out in the coming months purely based off the full lineup announcement.